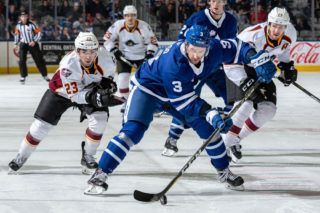 The Toronto Marlies split their weekend series against Atlantic Division opponents after a 5-2 loss to the Lehigh Valley Phantoms Sunday evening at Coca-Cola Coliseum. 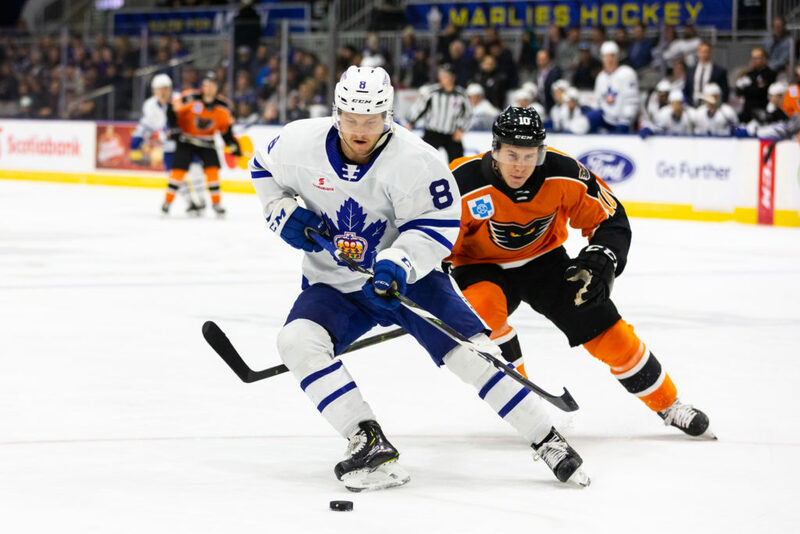 Phil Varone scored twice in the opening frame for the Phantoms and for the second straight game, the Marlies found themselves in a 2-0 hole in the first, but this time they were unable to fight their way out of it. Pierre Engvall did have a response early in the second, deflecting Jordan Subban’s point shot to halve the deficit. Carl Grundstrom had the secondary assist on the goal. Midway through the second, Nicolas Aube-Kubel scored for Lehigh Valley, making it 3-1 heading into the third. 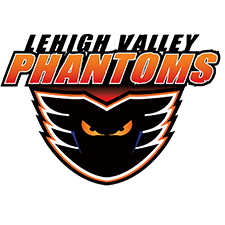 Morgan Klimchuk again cut the deficit to a single goal as he picked off a breakout pass and skated in to put it away, but four minutes later Chris Conner gave the Phantoms a 4-2 lead and Taylor Leier converted on a late penalty shot to lead to the 5-2 final. Klimchuk’s goal was his second in as many games for the Marlies since being acquired in a trade from Calgary earlier this week and Engvall has also now scored in consecutive games. Eamon McAdam made 35 saves for the Marlies while Carter Hart stopped 33 of 35 at the other end. 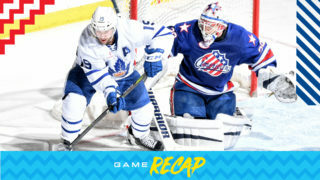 The Marlies move to 9-8-2-2 with the result while Lehigh Valley improves to 13-6-1-1. Action resumes at Coca-Cola Coliseum on Wednesday when the Providence Bruins visit. Pierre Engvall scored at 4:58 of the second period. Engvall scored in his second consecutive game. Engvall has 13 points (7 goals, 6 assists) through 20 games. Morgan Klimchuk scored unassisted at 6:10 of the third period. Klimchuk has two goals in his first two games as a Marlie. Jordan Subban recorded the primary assist on Engvall’s second period goal. Subban has eight points (2 goals, 6 assists) in 15 games this season. Carl Grundstrom registered the secondary assist on Engvall’s second period goal. Grundstrom has six points (2 goals, 4 assists) in his last six games. Eamon McAdam stopped 35 of 40 shots he faced. McAdam is now 4-1-2-1 on the season with a .890 Save Percentage and a 3.31 Goals Against Average. Toronto went 3-for-4 on the penalty kill and 0-for-5 on the power play. Lehigh Valley had a 40-35 edge in shots in all situations. 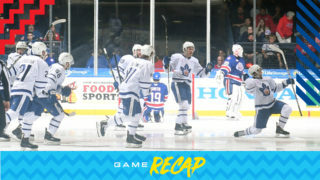 Carl Grundstrom and Trevor Moore led the Marlies with five shots on goal. The Marlies are 2-1-0-0 against Atlantic Division opponents and are 0-1-0-0 against the Lehigh Valley Phantoms this season. We need to be better in every single regard. Every time we show or take steps in one area, we aren’t able to sustain it. We lose it the next day or the next period, or the next shift. It’s pretty disappointing and pretty frustrating. We’re just going to continue to work as a group here, but there’s not one area of our game that doesn’t need attention. 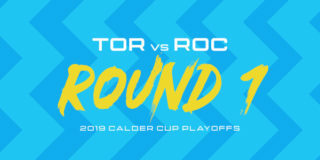 The Toronto Marlies (9-7-2-2) and Lehigh Valley Phantoms (12-6-1-1) will face off Sunday for the first time since last year’s Eastern Conference Finals, a series the Marlies swept on their way to the first Calder Cup in franchise history. 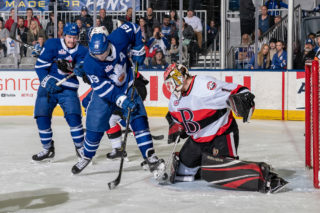 It’s the second straight game against an Atlantic Division opponent for the Marlies who lit up the scoreboard in a 7-4 victory over Wilkes-Barre/Scranton on Saturday, and enter today’s contest with points in their last five games, four of which were wins. 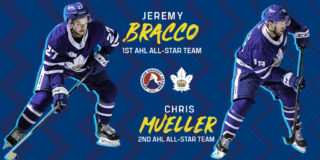 There are a number of familiar faces and names from May’s series on both sides, including Marlies leading point-getters Chris Mueller (10G, 11A), Calle Rosen (2G, 16A), Trevor Moore (11G, 5A) and Carl Grundstrom (7G, 9A).